Saturday morning sessions move to the American Legion Post. Barbara Patterson, National Farmers Union, explains the “Food Safety Modernization Act: A Bridge We Must Cross”. A panel discussion “Bridges to a New Farm Bill” is moderated by Bill Spiegel, editor of High Plains Journal. Panelists are Lisa French, Cheney Lake Watershed Inc.; Jim French, Center for Rural Affairs; Sandy Proctor, KSRE; and Sharon Karr, Kansas Farm Service Agency committee member. In the convention keynote, “Thoughts and Reflections on the Farm Crisis of the 1980s, and How We Came Through It,” Senator Nancy Landon Kassebaum Baker has a conversation with Nick Levendofsky about her time in the Senate, her role during the Farm Crisis of the late 70’s and early 80’s, women in politics, and how things have changed since she left office 20 years ago. We move back to the Best Western for the annual convention banquet and the presentation of prestigious 2017 Ruth Hirsh Award. National Farmers Union’s Barbara Patterson from talks about the Food Safety Modernization Act and why it matters to all producers and consumers. The regulatory landscape in DC is constantly changing. Farmers know better than anyone that regulations can have big impacts on their farms. The Food Safety Modernization Act is not going anywhere and has consequences for family farmers. This session will outline the food safety landscape, identify best practices, share the consequences of the act, and discuss FSMA in the context of regulatory reform. 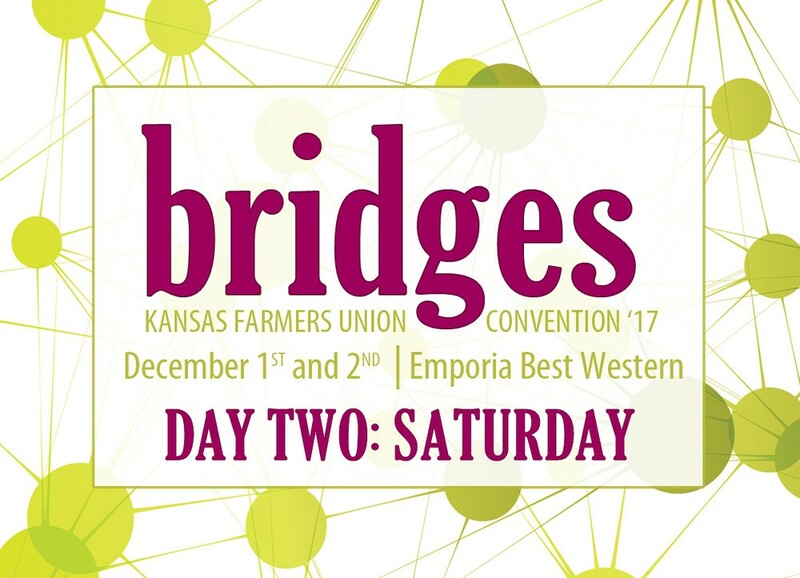 Ballots available beginning at 9:30 a.m. Voting ends at 9:50 a.m.
Kansas is fortunate to have many diverse perspectives on the Farm Bill. Members of this panel will discuss their own perspectives and take questions about what the Farm Bill, up for reauthorization in 2018, will mean for the state. Lisa French, Watershed Project Coordinator, Cheney Lake Watershed Inc. In the convention keynote, Senator Nancy Landon Kassebaum Baker has a conversation with Nick Levendofsky about her time in the Senate, her role during the Farm Crisis of the late 70’s and early 80’s, women in politics, and how things have changed since she left office 20 years ago. Farm tour bus departs from the Emporia Best Western at 2:00 p.m. and returns at 5:30 p.m.